Once you’ve seen Blackbird, please leave us a comment and tell us what you thought! I am embarrassed, truly, that only 2 weeks after the excellent Embedded closed that I am again compelled to rave about another Jobsite production. Unfortunately since they have produce a piece of riveting theater I have no choice but to reach for more superlatives. As uncomfortable and excellent as The Goat, which was also directed by Karla Hartley, Blackbird also intimately investigates a different kind of love. It is creepy, and dirty and very wonderful. 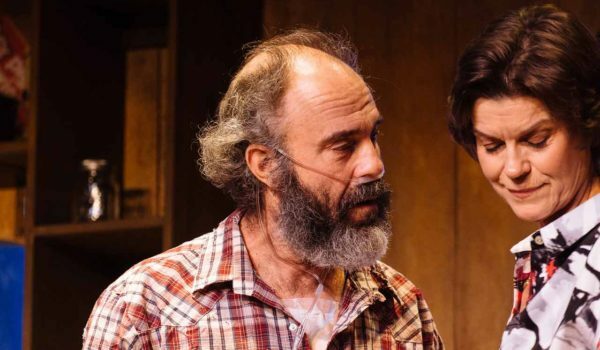 After a slow start, the only real weakness of the play, this primarily two actor piece becomes so compelling one cannot help but be totally engaged even if feeling uncomfortable. One man, one woman, one room, throwing up accusations, hurts and regrets that have simmered for 15 years. Both actors, Paul Potenza and Caitlin Eason are excellent, with Caitlin being particularly strong. Both flawlessly work through long monologues requiring the display of hate, anger, fear, regret, longing and love. After the show ends you will be not only entertained by first rate acting, you will have your conceptions about relationships and what is appropriate challenged. I said it for Embedded, and I’ll say it again for this. Quit watching the stupid tv and get out and watch some great live theater that has substance to it. As always – thank you for the feedback, David! I heartly recommend people take the time to see Jobsite’s production of BLACKBIRD. It is a compelling night of theater that is told with the utmost commitment and stellar talent of Caitlin Eason and Paul Potenza. Karla Hartley’s direction of this production is just another example of her intelligence and strength as a director. Bravo!